There was a time when the people of Egypt worshipped animal-headed gods and built mighty tombs at the command of their pharaoh. That time ended 1,500 year ago. Now, Egypt is a Muslim nation, ruled by a sultan from the new city of Cairo. The Guild of Seekers have the sultan's blessing to dig up the land's ancient treasures. To the south, Nubia is a Christian county, protected from the Muslim armies by an ancient treaty. The empire of Ethiopia is resurgent, its Christian ruler inspired by his pilgrimage to Jerusalem. The lands of the Nile hold some of the oldest cultures in the world, no less vigorous in the medieval period than in the ancient past. This book includes rules for Egyptian tombs and their treasures, the forbidden corpse magic of the Nubian pyramids, and the wonders of the Nubian alchemy. Play as natives or visitors from Europe. Use the setting as somewhere for your characters to be from or as a destination for adventure. 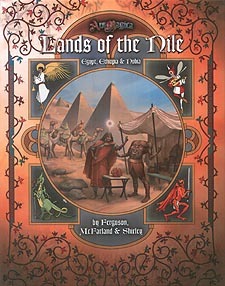 Lands of the Nile adds colour to your Ars Magica Fifth Edition saga.